Buy Cavinkare Nyle Naturals Damage Repair Shampoo. It works on your scalp, hair and hair tips to fight the signs of damage. Why should you choose Nyle? Nyle is an established shampoo brand known for its do-good properties and for providing value-added benefits through the herbal platform. Enriched with the goodness of both natural and exotic herbal ingredients, Nyle range of shampoos cleanse, moisturize, nourish and strengthen your hair making it supple and soft from root to tip. Its rich lather and natural fragrances give you a holistic bathing experience. With its eclectic mix of exotic and traditional ingredients, Nyle herbal shampoo enjoys a pan-India appeal with women from different age brackets and stands out as the only branded transparent herbal shampoo in the Indian sub-continent. Every drop of Nyle Shampoo contains a unique Nutrition-boost complex, filled with the goodness of Green Apple, Lemon, Amla & Henna. 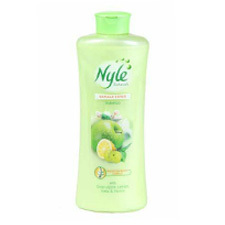 Nyle Naturals Damage Repair Shampoo works on your scalp, hair and hair tips to fight the signs of damage. Lemon: Lemon helps to repair damage caused by dandruff on scalp. Amla: Amla and green apple contains vitamin C that nourishes hair making it resilient to damage. Henna : Henna helps in maintaining a healthy scalp and hair. Apply directly on wet hair. Rinse thoroughly with water.